Legendary country music singer Glen Campbell passed away on Tuesday, August 8th, 2017 after a long battle with Alzheimer’s. He was 81. Campbell died around 10 am on Tuesday at a facility for Alzheimer’s patients in Nashville, TN. Campbell released more than 70 albums over his 50-year career. His hits included: “Rhinestone Cowboy”, “Southern Nights”, “Gentle on My Mind”, “Wichita Lineman”, “Galveston”, and “Country Boy”. He sold 45 million records and had numerous hits on both the pop and country music charts. Campbell was inducted into the Country Music Hall of Fame in 2005. Before his own recording career, he was a session musician who played with artists like Frank Sinatra, Dean Martin, Nat King Cole, Elvis Presley, Rick Nelson and groups like the Beach Boys and the Mamas and the Papas. Campbell was also an actor — starring in “True Grit” with John Wayne — and TV host. 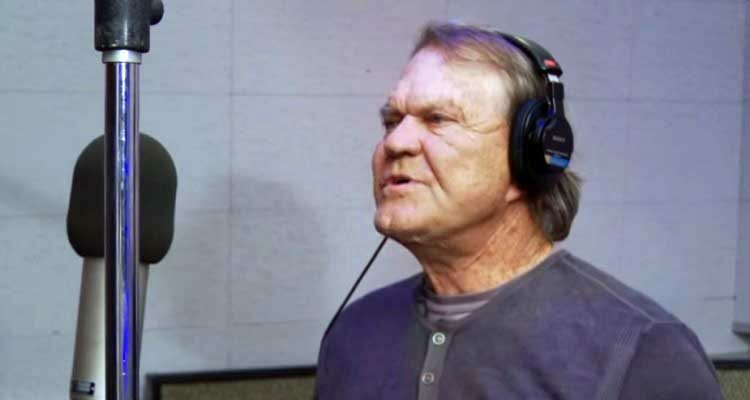 He has his own show called “The Glen Campbell Goodtime Hour” on CBS from 1969-1972. Mr. Campbell revealed that he had Alzheimer’s in June 2011, six months after his original diagnosis. At that time, he said that he was going ahead with a farewell tour later that year in support of his new album, “Ghost on the Canvas”. The announcement of his condition was made public because he and his wife, Kimberly, want his fans to be aware of his condition if he appeared disoriented on stage. The five-week tour turned into 151 shows over 15 months. His last performance was in Napa, CA, on November 30th, 2012. Campbell’s final studio album, “Adiós,” was released in June. The album included guest appearances by Willie Nelson, Vince Gill and three of Campbell’s children. It had been recorded after the farewell tour. He is survived by his wife, Kim, and eight children. To read more about Glen Campbell, here is his Wikipedia page. What an amazing musician – such talent. I really enjoyed the documentary on Netflix as well. I would recommend it to anyone to watch.